What he played did as much to form my music as my writing those songs…one of the great slide players of all time. —Jackson Browne. 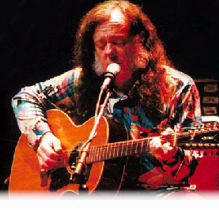 David Lindley is a Grammy-nominated multi-instrumentalist who redefines the word “eclectic.” His instrument rack is packed with exotic string instruments, including the acoustic and electric guitar, banjo, electric lap steel guitar, Weissenborn, mandolin, fiddle, saz baglama, bouzouki, and oud. Known for his 40-plus years as the featured accompanist with Jackson Browne and as the leader of El Rayo-X, Lindley’s singular, virtuoso, and often very funny performances mish and mash American folk, blues, and bluegrass with African, Arabic, Asian, Celtic, Spanish, Breton, Turkish, Armenian and Persian traditions. Lindley has contributed to recordings and performances by Bob Dylan, Ry Cooder, Curtis Mayfield, James Taylor, Warren Zevon, Rod Stewart, Etta James, Bonnie Raitt, Eric Clapton and Ben Harper, who has credited Lindley’s slide guitar style as a major influence on his own playing. Lindley worked on the Oscar-nominated soundtrack to Werner Herzog’s Journey To The End Of The World and on many other film scores including the ’60’s classic Zabriski Point.